Ever Have Your Skirt Lining Rip All the Way up the Center Back? The lining on this skirt was really tight. 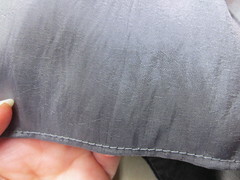 Lining fabric doesn't have any give in it anyway, so this one just split beside the seam. 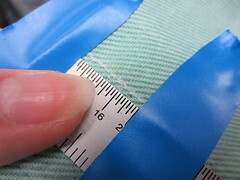 The rip was several inches up from the hem, along the seamline. I had to add fabric to give the girl some room for movement. That is called a gusset. As you can see, this girl made quite a mess of this lining. 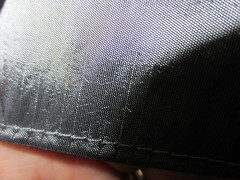 The tear was near the seamline, but not actually a rip in the seam. 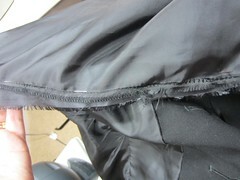 Stitching that area closed would only make the lining width smaller and the next wearing would have the same results...another rip. The first thing to do is find lining that matches. After that, I cut a large triangular piece of lining that would fit in the space left by me spreading the ripped area apart a bit, forming a triangle. 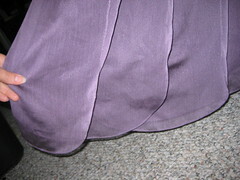 Then I sewed one side of the triangle from hem to point. 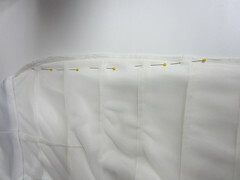 After that I sewed the other edge from the point to the hem. 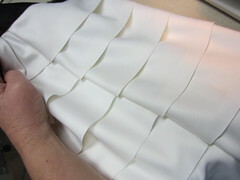 The right side of the skirt lining looks like this. It's a little tricky to get the apex (point) of the triangle to lie flat and not bulky. 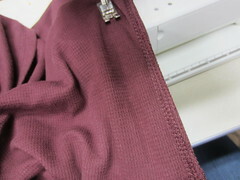 Just remember to trim the seam allowance after you get the right side looking good. 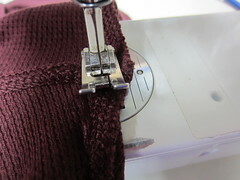 If your gusset is on the outer fabric of a garment, where it will show, you may need to rip and redo a few times to get it right. Here, though, it hardly shows since it's on the inside. The bottom edge looks like this. As you can see, I've left plenty of extra fabric. When you are manipulating that triangle to get it in the perfect position, you don't want to worry about running out of hem allowance. 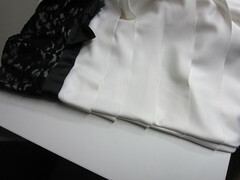 Just finish it off to match your garment and you are finished...lots more room to move! 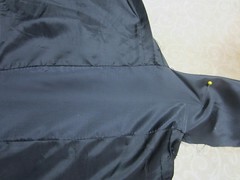 The zipper had been originally stitched on the right side of the dress, even though it is an invisible zipper. I'm seeing a lot more of this lately. 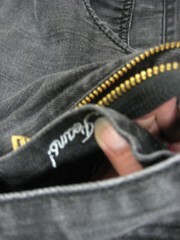 I think the word is out to manufacturers that those zippers are weak and unreliable. 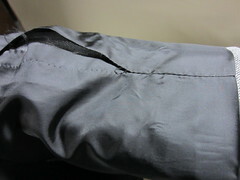 So I could get about 1/2" out of each side of the center back seam. 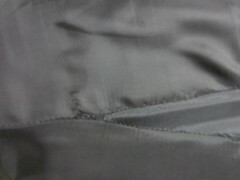 You can see this by the folds and the needle holes. Since that was not enough, I actually exposed the zipper tape. This got an additional 1/2". That gave her 1 1/2" total, just enough for her to zip the dress and head to prom. It wasn't until I sewed a few inches on this hem that I realized that I hadn't changed my needle. I usually use a large needle that will go through most anything. I only change when the garment is delicate. Below you see why. 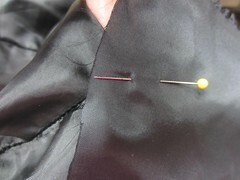 The needle is puncturing the fabric, not poking in between the threads. My stitches are actually distorting the fabric. Sometimes this is caused by a dull needle. Today, I know it is the size. I forgot to adjust for this bridesmaid dress. Here's a little clearer view. 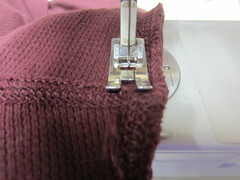 Since the needle is poking the thread, rather than going through the weave, it pulls the threads, leaving those lines. They are not repairable. They are permanent. Luckily, they are not visible from a distance. The client will not know my mistake. Whew! 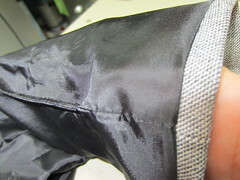 And I caught the trouble early enough that it only affects a small part of this hem job. Sometimes when you have done a job like this so many times, you get complacent. Avoid that at all cost, so your quality remains its best. One of my sewing machines is a beautiful industrial machine that I use for light manufacturing. If I can guide the fabric, it will do all the rest, including automatically trimming the thread! Some times it even makes my lunch for me (ok, not really). It is so great for all these things because that is all it does. One of my other machines is a nearly 30 year old Bernina. 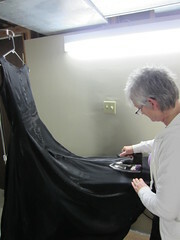 It's been tried and true for thousands of alterations and it's still going strong. It has a 5 step buttonhole maker that was state of the art for a mechanical machine back in the day. Today, a lot of machines are electronic and buttonholers are automatic. I don't create a lot of garments anymore. 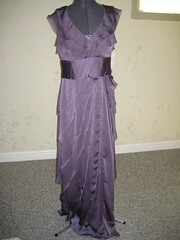 Alterations keep me pretty busy. I don't miss the buttonhole functionality much. 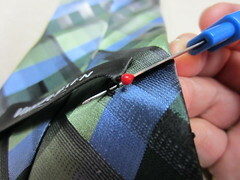 When I do have to make buttonholes, I have found a way to make them uniform. It involves a non traditional sewing notion called electrical tape! 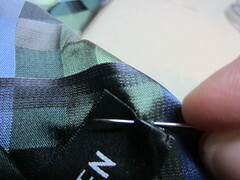 I start with a chalk line marking the center of the buttonhole. After determining the distance from the edge that I am placing the buttonhole, I place a piece of tape where the top of it will land. 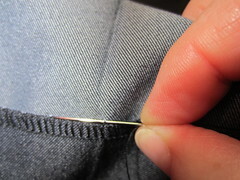 I then measure the length of the buttonhole, as you see here. 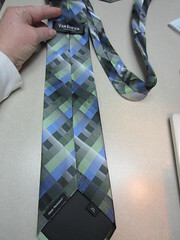 I put a piece of tape where the bottom of the buttonhole will land. Since this is the top of a new curtain for my sewing room, I want the buttonholes to be even. I tried using Scotch tape, but it didn't show up too well. The blue tape makes it was to see where my machine needs to stop. Now I let my machine do the work. 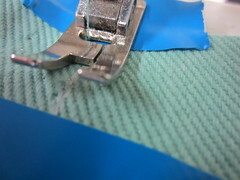 It doesn't hurt to sew into the tape once or twice. It will dull your needle just a little faster than normal, though. And the finished product! 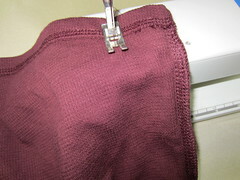 Now this fabric was a sturdy twill for a curtain that closes off one wall of my fitting room. 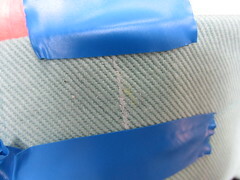 Of course you will want to try the tape on a piece of scrap to make sure you don't damage or stretch the fabric. I haven't had any trouble, though. It is much easier to reposition if the first try doesn't work, and it's easier to see than a line of chalk or fabric marker. 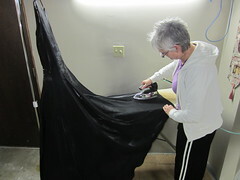 Some folks feel that they cannot start an alterations business because they do not have a variety of sewing machines. That is simply not true. Hemming is a perfect example. 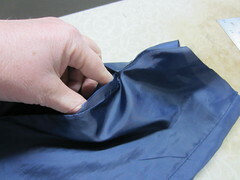 You can easily make a very conceiled hem, using the following instructions. Take care to space your stitches very evenly. Then if they show slightly they will be consistent. 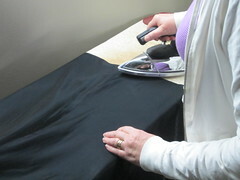 Many clothing shops and alterations places will charge extra for a hem put in by hand. 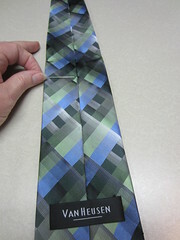 After all, fine handwork is one sign of professional couture. 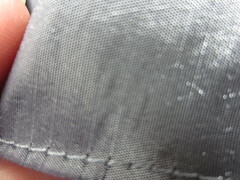 After tucking the thread knot under the hem allowance, I come up through the serging stitches. 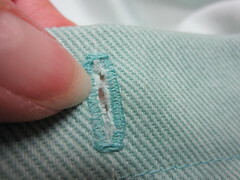 I then carefully insert the needle into the fabric, picking up 2 stitches. 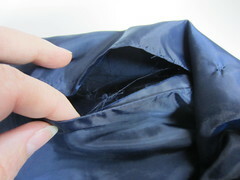 On a fine fabric it can be one, but on most fabrics, that may cause the single stitch too much stress. It could pull, or possible break the stitch. 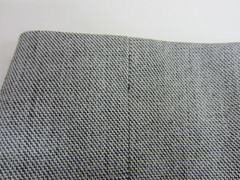 The right side of the fabric will look something like this. You will see the sparkle of the needle, but not too much of it. If the needle looks too visible, you have taken up too many stitches. It is a warning that your hem stitches will show. While I am still grasping the needle in the same position, after taking a stitch in the fabric, I take another one under the hem allowance. This will become one smooth stroke as you improve your skills. 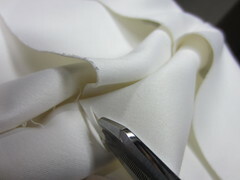 I then come up again through the serging. The final product should look like this. Of course your fabric may prevent you from totally conceiling the stitches. But if you match your thread color well and take care to make your stitches evenly spaced and uniform, you will get a professional look. 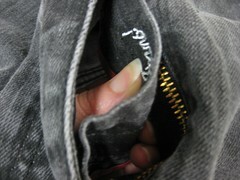 I have never seen a zipper constructed like This. 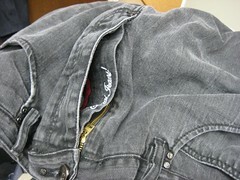 It honestly wasn't too much different than replacing a regular jean zipper. But sometimes ya just gotta ask "Why?" At first I was confused by this extra fabric. What is going on here? Of course I had to take my own instruction, here. 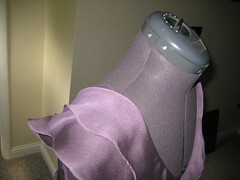 I begin almost every tutorial with Step One: Examine the Garment. 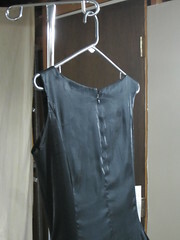 After a closer look, I determined which stitches to rip out and where to place the zipper. Everything had to be attached to the inside fly area. 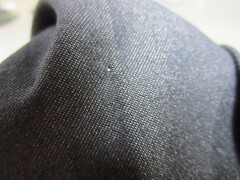 Lastly, I had to attach the fly to the outer pant area and topstitch. Do you know why they made this like it is? Leave me a comment if you have it figured out!